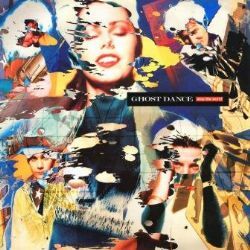 GHOST DANCE were a Goth Rock band founded in 1985 by ex-Sisters Of Mercy guitarist Gary Marx and ex-Skeletal Family vocalist Anne Marie Hurst. Long deleted on CD, STOP THE WORLD was their second album, issued on Chrysalis in 1989 (their first LP, Gathering Dust, was a compilation of their first three EPs, issued on the Karbon label. Anne Marie Hurst and other band members are involved in this deluxe 2-CD reissue, which mops up lots of non-album material, from exclusive B-sides to various live tracks which were only available on a limited edition bonus 12” single (as well as the rare original CD). Includes the singles ‘Celebrate’ (a re-recording of the album version) and ‘Down To The Wire’ (which reached the UK Top 75). · After a tour supporting The Ramones. Ghost Dance broke up soon after the release of Stop The World but Anne Marie and Gary Marx both remain active as performers to this day. The sleeve-notes boast quotes from the various band members alongside rare photos and images of cuttings and memorabilia from that period.